"A Form specializing in Limit attacks." Limit Form is a Drive Form that appears in Kingdom Hearts II Final Mix. It uses neither of your team members, and consumes four of Sora's Drive Bars. It represents Sora's past, and is obtained along with Oathkeeper at the end of the second visit to Twilight Town, after Sora learns about Kairi's abduction. Its emblem is a silver crown. 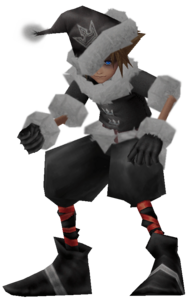 Limit Form changes Sora's clothes into the same colors and style of the clothes he wore in Kingdom Hearts and Kingdom Hearts Chain of Memories, with the addition of a red crown on his knees. This is the only Drive Form in which Sora has no auras of light surrounding him, although whenever he enters a new area, his torso glows red for a short time and a few specks of light fall off of him. 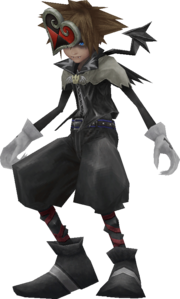 Limit Form's version of Guard uses the Kingdom Hearts guarding motion, rather than the standard Kingdom Hearts II motion. Limit Form is a unique form that mimics Sora's abilities from the original Kingdom Hearts game. In this form, Sora's Magic commands are replaced with new Limit commands, whereby special abilities from Kingdom Hearts can be accessed for a set MP cost. Since magic is disabled, Sora cannot use Cure to heal; to compensate, each hit from a Limit recovers some HP. With the exception of Sonic Blade, the Limit attacks do not have invincibility frames that can be exploited by delaying the followup attacks, as they did in Kingdom Hearts. In general, Limit Form is a more simplistic Drive Form, as Sora retains much of his normal movement and basic combo attacks, albeit with new finishers and counter-attacks. However, Limit Form has the advantage of being able to block, jump slightly higher than usual, and roll across the ground using the form's Growth Ability. Limit Form gains a single point of experience each time a Limit is used successfully. Leveling up upgrades the form's Growth Ability, Dodge Roll for both itself and Sora's standard form. Also, level-ups reward Sora's standard form with the Auto Limit, Draw, and Lucky Lucky abilities. Zantetsuken Lv1 Unleashes a finishing combo move on a single target. This powerful attack can instantly eliminate weaker enemies. Ripple Drive Lv1 Unleashes a finishing combo move when surrounded. Damage dealt is relative to magic skill. Hurricane Period Lv1 Unleashes a powerful finishing combo move consisting of an aerial barrage. Zantetsu Counter Lv1 Unleashes Zantetsuken by selecting Attack while guarding. Reflect Combo Lv1 Blocks enemy attacks with Guard by pressing Square during a combo. Guard Lv1 Blocks and shoots back enemy attacks using a parrying action with . Slapshot Lv1 Rapidly attacks a nearby target without getting flung back. Sliding Dash Lv1 Instantly closes in on and attacks a far target. Aerial Sweep Lv1 Unleashes a powerful leaping attack on targets in midair. Auto Limit Lv2 (Standard) Automatically sets the Reaction Command to Limit in a pinch, if Limit Form is usable. Lv3 (Standard) Dodge enemy attacks by tilting the left stick and pressing . More efficient at higher levels. Lv5 (Standard) Dodge enemy attacks by tilting the left stick and pressing . More efficient at higher levels. Lv7 (Standard) Dodge enemy attacks by tilting the left stick and pressing . More efficient at higher levels. Dodge Roll MAX Lv7 Dodge enemy attacks by tilting the left stick and pressing . More efficient at higher levels. HP Gain Lv1 Restores Sora's HP when a Limit Command lands. Lv4 (Standard) Draws in and obtains nearby orbs. Equip 2 to obtain for orbs. Lv6 (Standard) Will bring luck by increasing the drop rate of items. Equip the whole Party to further increase the drop rate. MP Rage Lv1 Restores MP relative to the amount of damage taken. Equip more to increase the effect. MP Haste Lv1 Increase MP restoration speed by 25% after MP is fully consumed. Equip more to increase the effect. As Limit Form can be used without either of Sora's party members, it is especially useful in solo fights such as the Battle of the 1000 Heartless as well as the boss fight against Roxas. Its Limits can deal considerable damage while also healing Sora. To effectively level up Limit Form, equip as many Form Boosts as possible before engaging in battle, including Oathkeeper, and repeatedly use the Sonic Blade limit, which costs the least amount of MP to use, until MP runs out. Return to a Save Point to recover MP before returning to battle. Repeat the process until the Form gauge is about to run out, then leave the world and return to refill the Drive Gauge to maximum. Continue in this way until Limit Form reaches the desired level. Using an Ether immediately before a Limit can sometimes cause the MP to be refilled after the Limit completes, increasing the MP efficiency of training. The best places to train Limit Form are the battle with Mushroom No. 5 in Agrabah, which is near a Save Point, Ruin and Creation's Passage, which contains many Nobodies and is adjacent to the Altar of Naught, allowing Sora to quickly revert and refill his Drive Gauge, and the Battle of the 1000 Heartless, where Sora can unleash an immense amount of Limits due to the huge quantity of Heartless quickly refilling his MP and Drive Gauges. ↑ Yen Sid's mirror: "An image of you obtaining old powers flows into your mind." This page was last edited on 24 April 2019, at 16:59.